I really had been hoping to announce that all of my California travel plans are settled. However, I’m still figuring out the car rentals, so all you get are posts about shoes. Maybe later today I’ll be able to pop back in with an update on the travel arrangements. 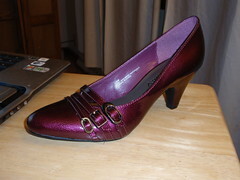 Anyway, I bought these, um, the day before I bought the black heels in the previous post. I was on a boot quest that day too, which of course failed. Then I saw these and had to have them. Went looking for boots and cute black heels last weekend. The boot quest was a bust — my calves are too fat in proportion to my tiny little feet. I couldn’t even zip most of them all the way. How ridiculous! 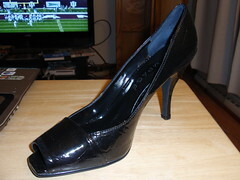 But I did find these black heels, so all was not lost.